FTD® proudly presents the Beauty and Grace™ Bouquet by Vera Wang. 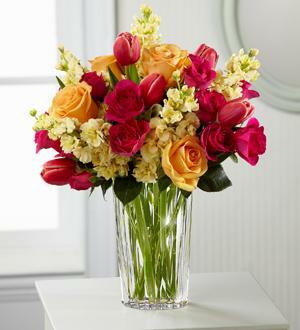 Displaying a refreshing sense of color and sunlit sophistication, this bouquet of fuchsia tulips, peach roses, pale yellow stock and hot pink spray roses are presented in a modern clear glass vase to delight your special recipient with its eye-catching demeanor. GOOD bouquet includes 12 stems. 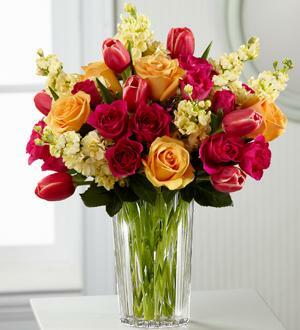 Approximately 16"H x 12"W.
BETTER bouquet includes 18 stems. 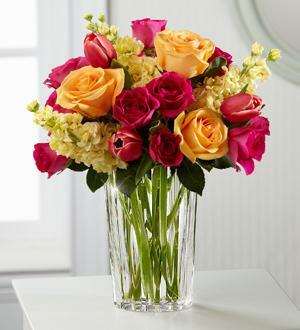 Approximately 18"H x 13"W.
BEST bouquet includes 22 stems. Approximately 19"H x 14"W.